The Black Spiderman Costume was born in Secret Wars #8. 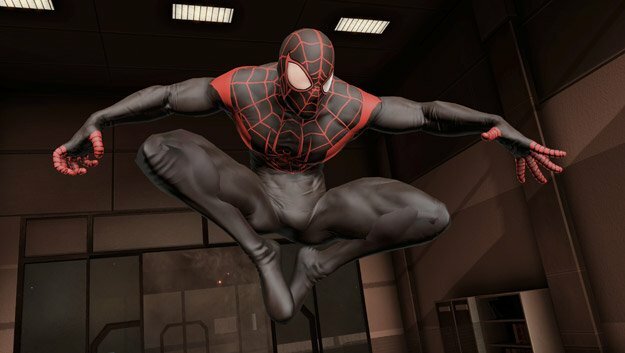 Spidey wants to replace his much-torn costume but chooses the wrong costume machine, which released black blob covered his body and then transformed into the black costume. Spidey discovers that the costume has the power to generate webbing, and returns to earth with his black spiderman suit in Amazing #252. He also discovers that it also has the power to change to appear as normal street clothing. However in the following few issues, the costume starts behaving quite strangely. In Spectacular Spider-Man #99, Felicia gives Peter a set of five cloth Black Costumes, and he wears the first one in Amazing #263. For the next couple of years, he alternates between the red and blue spiderman costumes, and the black spiderman outfit. Different writers had their own preferences, and often he used the black at night, and the red and blues during the day. During a battle with the villain Magma Spidey’s last remaining red-and-blue costume was destroyed. At that point Peter decided to forego the red-and-blue and wear only the black costume form now on. But Mary-Jane pointed out that the Black costume reminded her of Venom Black costume, and insisting that Peter no longer wear it, that was the last time Peter wore it regularly. However, Peter did put on the black costume for a few special occasions after that. The reason mostly being that it makes him harder to see at night. Our Friendly Neighborhood Spidey has been zipping around Manhattan for decades with his traditional and not-so-traditional costumes. 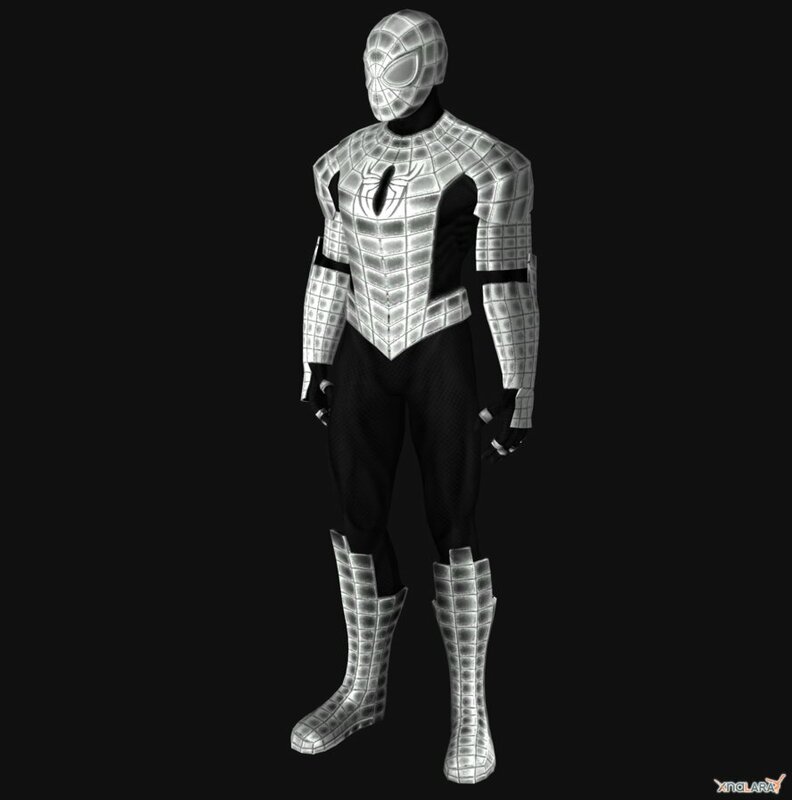 We’ve already seen the red and blue spider-man suit and the Venom-style black spiderman suit on the screen, but what about other more costumes? Here I listed 4 awesome Spider-Man Outfits I’d like to see brought to life on the big screen someday. This suit is a combination of several other designs, mixing the red and blue with the bigger spider logo. It’s a good mix, and would definitely translate to the big screen. When Peter Parker still had dibs on the Spider-Man identity but Ben Reilly wanted to do some webswinging of his own, the Scarlet Spider was born. The Scarlet Spiderman costume was designed by Tom Lyle. With some new colors and a Scarlet Spider hoodie over the classic superhero spandex suit, Ben took his design to the streets. His spider symbol goes on the front & the back, not straight up & down like Spider-Man’s symbol, but rather angled to the left as it’s worn. Short-lived though it may have been, the Scarlet Spider duds still stand as a bold take on the iconic Scarlet Spider costume. 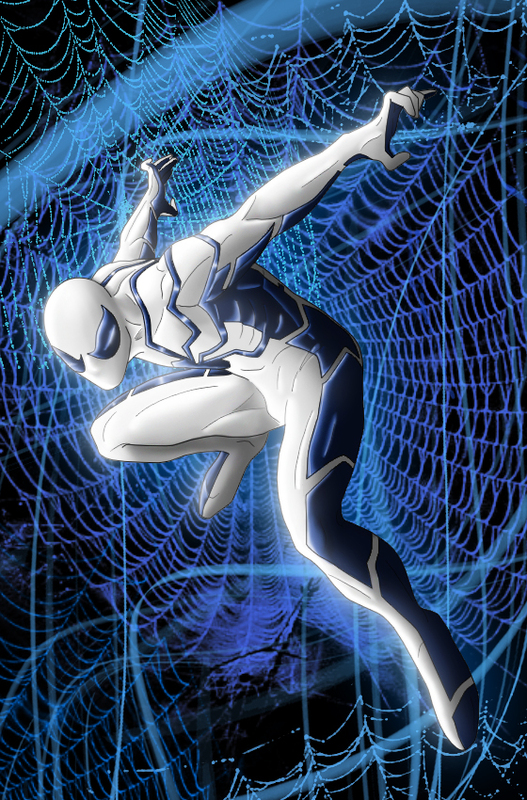 Spidey teamed up with the Fantastic Four for a while on their Future Foundation, to help solve the world’s problems. In addition to an awesome mandate, the group also had some pretty stylish white suits. The Spider Armor is the Spider-Man equivalent of empty calories. It’s totally a guilty pleasure and yes, we know it makes no sense for a character centered on speed and agility to be weighed down by a bulky metal costume…but c’mon—it’s so shiny! The Armor didn’t stick around longer than one specifically targeted adventure, so we can forgive its impracticality and merely bask in its wonderful excess.